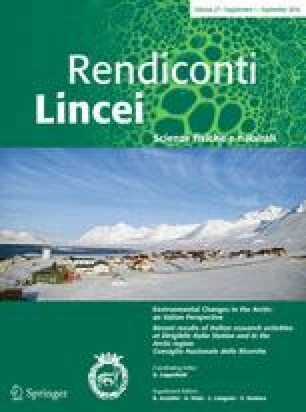 This peer-reviewed article is a result of the multi- and inter-disciplinary research activities based at the Arctic Station “Dirigibile Italia”, coordinated by the “Dipartimento Scienze del Sistema Terra e Tecnologie per l’Ambiente” of the National Research Council of Italy. The online version of this article (doi: 10.1007/s12210-016-0515-9) contains supplementary material, which is available to authorized users. This research has been conducted within the two Projects RIS-10242 (PI: E. Calizza) and RIS-10011 (PI: V. Pasquali) and was supported by Sapienza University Grants 2012. Authors wish to thank the CNR (Italy) for logistical support and Vetro Scientifica s.r.l. (www.vetroscientifica.it; Rome, Italy) for providing high-quality laboratory materials.